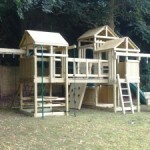 Multi Tower Climbing Frames offer the greatest adventure for your children. 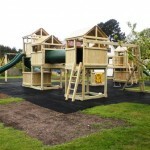 The pre-set designs from Action Climbing Frames represent fantastic value. While the modular design of the Home Front range means that you can design your own unique configuration. These bespoke systems offer an amazing opportunity to create something special in your garden. Based on our Small, Medium and Large Climbing Frames you can choose from three deck heights; 1.2m (4ft), 1.5m (5ft) and 2.1m (7ft). You can even join various heights to compensate for a slope or to add more adventure. The modular design means that the towers and accessories are guaranteed to fit and work together. Home Front Canyon Twin Set 7, two premium pine towers joined by a bridge and the price includes a slide, cargo net, swing arm and swing seat. Home Front wooden climbing frame set with a 1.2m high deck, this set includes two towers joined by monkey bars with a cargo net, slide, and swings! Two Towers providing twice the fun! This set includes many accessories including a slide, cargo net, firepole and swings. The towers are connected by Monkey Bars. Home Front Canyon Twin Set 5 is a wooden Climbing Frame made up of two Canyon Towers joined with a bridge, and many accessories including a firepole, slide, cargo net, swing beam and seats. Home Front Jungle Twin Set 7 is designed to be long and narrow and features two towers, a bridge, rock wall, ladder, firepole, super slide, tic tac toe panel and a telescope. Home Front Canyon Adventurer Twin Sets are two Towers joined together with capacity for twice the fun! This set includes a gangplank, bridge, cargo net, rockwall and many more accessories. Two Towers providing twice the fun! This set includes many accessories including a slide, cargo net, trapeze bar and rings. The towers are connected by Monkey Bars. Two wooden towers joined by a bridge, and this Home Front Canyon Twin Set 4 has many accessories to keep your children entertained for hours. These include; slides, swings, gangplank, ladders, steering wheels and telescopes! Two Towers providing twice the fun! This set includes many accessories including a Wavy slide, cargo net and swings. The towers are connected by Monkey Bars. Wooden garden play equipment from Home Front. The Canyon Twin Set 6 features two towers with a deck heights of 1.2m and lots of sliding, climbing and swinging accessories. Two Towers providing twice the fun! This set includes many accessories including a slide, cargo net, firepole and swings. The towers are connected by a bridge. Two Towers providing twice the fun! This set includes many accessories including a Wavy slide, Rock Wall, Ladder Beam and swings. The towers are connected by a bridge. Home Front Canyon Twin Set 3, the lowest tower in the Home Front range, the platform height is 1.2m so it is especially suited to younger children. This twin set has two towers and many accessories to keep all your children happy. Home Front Cosmic Set 5 has two different Towers joined together with different height platforms to keep a wide range of ages happy. The Home Front Cosmic Adventurer Sets are based around two different Towers joined together with capacity for twice the fun! Two Towers providing twice the fun! This set includes many accessories including a wavy slide, Tyre swing & Rock Wall. The towers are connected by a bridge. Huge Home Front Jungle Twin Set 8, has so many accessories, it will be hard for the children to know which to play on first! 2 slides, picnic table, and swings are just a few. Please click to find out what is included. Home Front Jungle Twin Set 9 has two towers with a bridge, joining them. Many exciting accessories are included such as a rock wall, cargo net, ladder beam, Tunnel twister slide, and various creative items. Home Front Cosmic Set 6 has three towers with different heights and a selection of accessories joined together to keep the children entertained for hours. Home Front Cosmic Set 7 has three towers with different heights and a selection of sliding, swinging and climbing accessories joined together to keep the children entertained for hours. Home Front Cosmic Set 8 has three towers with different heights and a selection of sliding, swinging and climbing accessories joined together to keep the children entertained for hours. Home Front Cosmic Set 2 is based around two different Towers joined together with capacity for twice the fun! The Home Front Jungle Adventurer Tower is the mid-height tower in the Home Front range, with a platform height of 1.5m (5’). Home Front Cosmic Set 3 is based around two different Towers joined together with capacity for twice the fun! Home Front Cosmic Set 4 is based around two different Towers joined together with capacity for twice the fun!